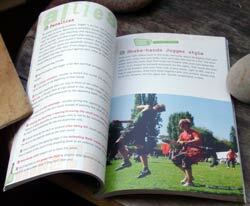 FINALLY: The first book on Jugger is available in English! 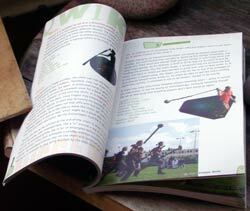 After days and days of translating, layouting, picture-cmyking, typesetting, typesetting, typesetting and a lot of furious cursing, I managed to get the first book on Jugger translated - with loads of new, stunning action shots, a detailed pomfey making step-by-step guide (now with pictures as well) and news on the international section. 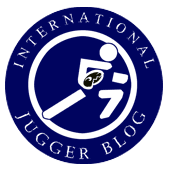 Here we go: "Jugger. 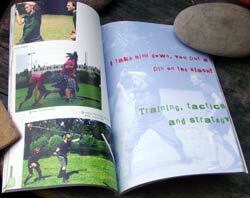 A post-apocalyptic sport for all occasions"! Thanks to Adam Horsten of Jugging Brisbane who did a thorrough proofreading and who was a great help with Jugger terminology, the book may now be purchased at Lulu (it will be available via amazon as well soon, but it does not always have to be the big fish who gets the worm, should it?). Of course, it is not cheap - 110 pages in full-color print do cost a bit ... but this is not my fault, to avoid all suspicion: I am earning incredible 31 cent (as in "small change", not as in "percent") share per issue sold; except if you buy it directly at Lulu's, where I get a bit more. Bahamas, here I come! British (especially for the Irish, I assume ...), Canadian and US teams as well, and maybe even all the many others who might not be that proficient with German but with English. Any publisher who is interested in printing this title may contact the German publisher, Verlag an der Ruhr (rights at verlagruhr dot de) for licensing. As soon as that happens, the title will no longer be available via the current printer, of course. 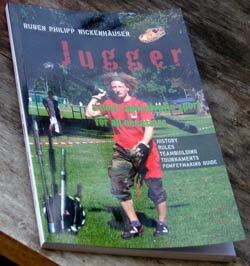 Ruben Philipp Wickenhäuser: Jugger. A post-apocalyptic sport for all occasions, Morrisville 2008, 29,95€, ISBN 13: 978-1-40922920-9 (soon to be applied) - details and ordering. Website support will be online soon. ... the Jugger film was published in 1989 and Jugger has been played since ca 1993? 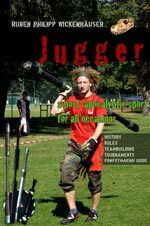 ... there is no "true" form of Jugger, only different sports variants as well as post-apocalyptic and LARP variants?